Supply Chain Heron Bros Ltd.
Heron Bros is committed to developing long-lasting and collaborative relationships with our supply chain partners as we recognise the value this adds to our business. We have worked hard to develop strong partnerships resulting in a dedicated workforce committed to delivering high levels of quality on time and on budget. We have produced our Heron Bros Subcontractor Handbook, which sets out what to expect from working with us and in turn what we expect from our supply chain. 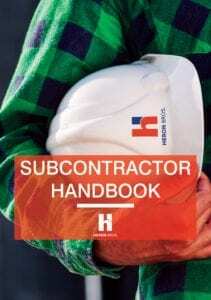 Download a copy of our Subcontractor Handbook to learn more about the company and how to become an approved partner. If you would like to apply to become a quality approved subcontractor, please complete our online pre-assessment questionnaire below. Last year we added 124 new sub-contractors from across the UK to our approved supply chain. If you are interested in working with us please download a copy of our Subcontractor Handbook and complete our pre-assessment questionnaire. Name of person responsible for implementing and co-ordinating health, safety and environmental management during contracts. You accept that by forwarding your details you have agreed to Heron Bros processing personal data concerning you, in order for Heron Bros to properly fulfil the contractual obligations to you and for legitimate business interests. Heron Bros recognises you have the right to opt out and remove your personal data at any time. To opt out, please contact our Data Protection Officer on info@heronbros.com.